Today we learned lots of Japanese sea vocabulary! In this review, we will list all the vocabulary words that were in the video and some that weren’t! 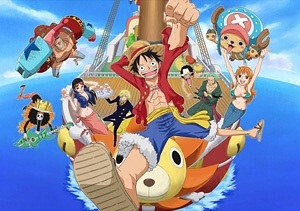 Learn the Japanese words for dolphin, whale, jellyfish, and many more! ★　Today we visited the virtual umi! 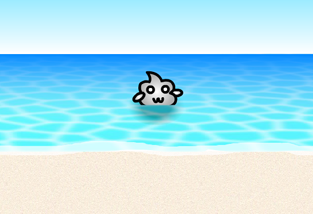 ★　Umi means sea or ocean in Japanese. 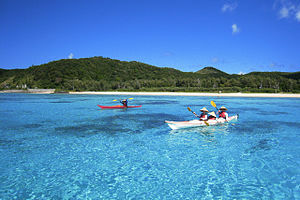 Although there is another word for beach in Japanese (sunahama), it is more common to use umi when referring to the beach. Nichiyōbi ni umi e ikimashō. Let’s go to the beach (lit. ocean) on Sunday. 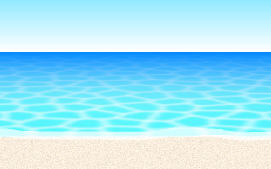 ★　The sound of waves is so relaxing! 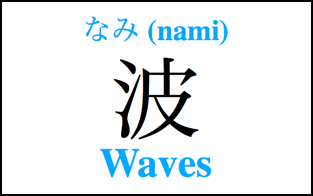 The Japanese word for waves is nami! 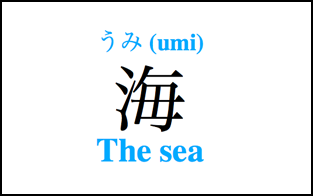 ★　The kanji for umi and nami both have a similar part (氵) on the left side called the sanzui radical. This radical can be found in many different kanji, and it gives the meaning of water. So if you see a kanji with this radical, you can guess that it has something to do with water! 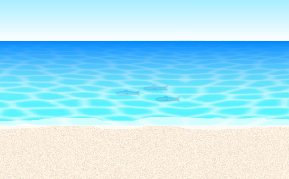 ★　We saw some beautiful fish swimming in the water! 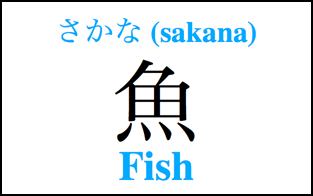 ★　The Japanese word for fish is sakana. 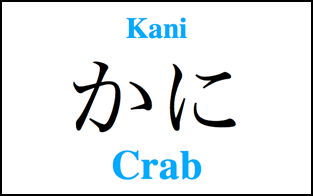 ★　Kani means crab in Japanese! ★　The kanji for kani is 蟹 – Although there is kanji for this word, most people just use hiragana or katakana to write it. 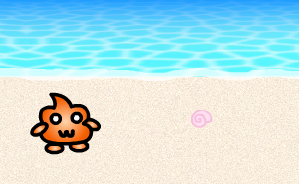 ★　Suna asobi means playing in the sand! 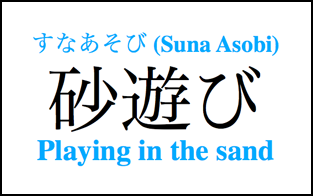 ★　This word is actually made up of two words: suna (sand) and asobi (play). 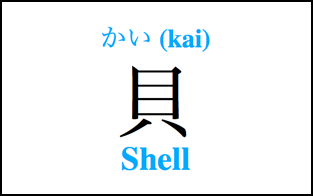 ★　The Japanese word for shell is kai! 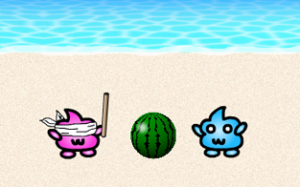 There are many types of kai on the beach! 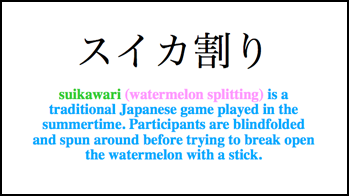 ★　After they break open the watermelon, they eat the pieces! When doing suikawari, be sure to cool the watermelon in the water first! ★　We also saw a hitode! …but actually it was just our friend. 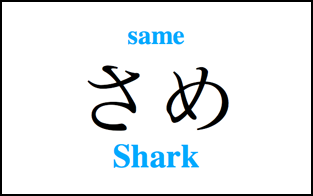 ★　The kanji for same is 鮫 – it is common to use this kanji, but it is also common to just use hiragana or katakana to write this word. The kanji in parentheses is not used very often. It is more common to use hiragana or katakana for these words. We learned a lot of Japanese words on our trip to the ocean! But there are always more words! Study the additional vocab list to expand your Japanese knowledge! And of course, make sure to watch the next episode of our new Japanese vocabulary series! OKINAWAAAAA!!! WE WILL BE THERE SOON! 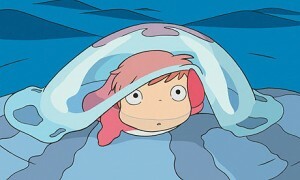 PUNI!! 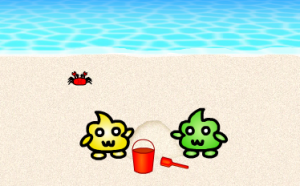 I just wondered if there is any logical reason why the kanjis for Oktopus (蛸) and the Kanji for frog (蛙)(from previous lesson) have the kanji for bug in them? What does a frog or an oktopus have to do with a bug? That is an interesting question (◕ω◕)☆ Kanji does not always seem logical, but there is usually a reason behind it. Kanji was invented by the Chinese a long time ago, and sometimes the meaning of certain kanji has changed over time, and also in use when it was adopted by Japanese. So, maybe this original broad definition is the reason that other animals such as octopus and frog also have this kanji radical. what is the Japanese word for squid? 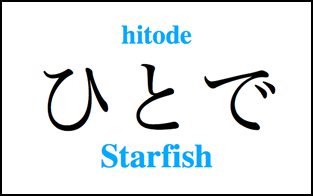 I found some other kanji for starfish (海星, with literal meaning – sea+star – but the same sound as that you presented) and jellyfish (水母, literally “mother of water”). Are they commonly used? Is that OK if I use them in some occasions? Thanks. Many many thanks for the clarification, sensei! I’m not sure I understand your question, but I will try to answer. There are always multiple ways to say the same thing in any language, but here is one way.